All set for the big day? Social & Personal reveals the best way to Double Cleanse your skin to glory! 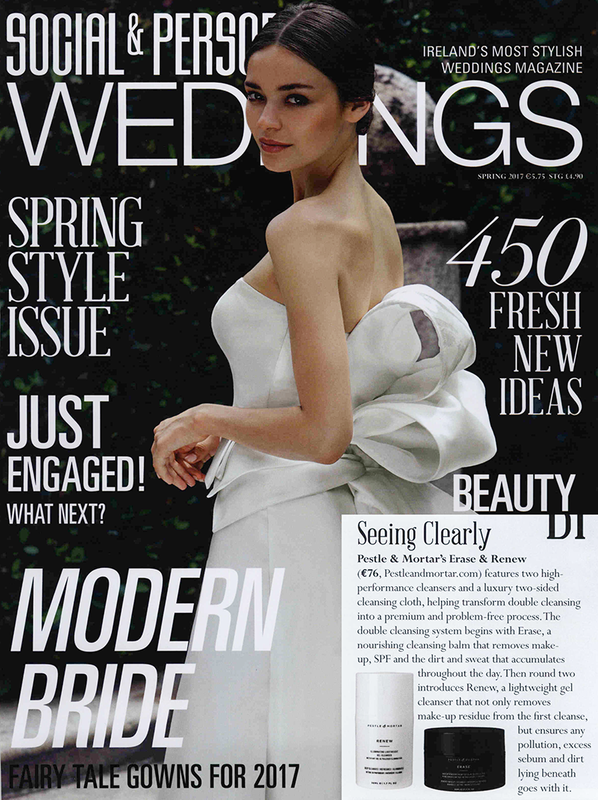 Social & Personal is Ireland’s most stylish weddings magazine. And they suggest you to Double Cleanse your way to clean, clear and glowing skin before the Big Day! Double Cleanse your way to Clear Skin! Pestle & Mortar’s Erase & Renew features two high-performance cleansers and a luxury two-sided cleansing cloth, helping transform Double Cleansing into a premium and problem-free process. The double cleansing system begins with Erase. It is a nourishing cleansing balm that removes make-up, SPF and the dirt and sweat that accumulates throughout the day. Then round two introduces Renew, a lightweight gel cleanser that removes make-up residue from the first cleanse. It ensures any pollution, excess sebum and dirt lying beneath goes with it too. Read the full story on Social & Personal, now on stands!